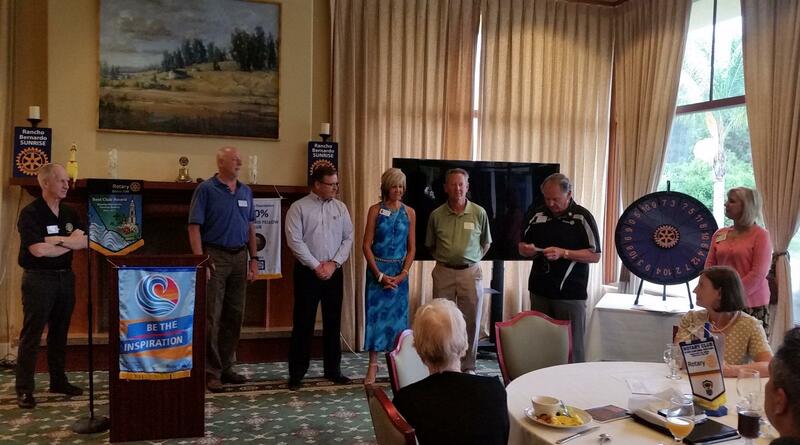 Meet the two newest members of the Rancho Bernardo Sunrise Rotary Club; Sandi Menderson of Bella Reflections and Brian Gansert of Ace Parking. We're delighted to have them as part of the Rotary family, and look forward to getting to know them better over the coming years. Shown here, from left: Club president Mike Moffat; Phil Schneider; who will help guide Brian through the Red Badge process; Brian Gansert; Sandi Menderson; Sandi's husband Jon Svendson; Past District Governor Carl Kruse; and Membership Chair Mary Stanton. To learn how you can be part of this thriving Rotary club, join us any Tuesday morning at 7am at the Rancho Bernardo Country Club. We guarantee you a great time, and promise you'll want to come back...again and again.